I've never mentioned it before on my blog, but I'm a big Sims fan!!! I recently got the Sims 4 game! I have been playing Sims from the beginning! As an avid player of course I sometimes murder my Sims, but not the ones I like, I create new Sims to kill them, ha-ha! I know, it sounds terrible, but it is the only way to get ghosts and now in the Sims 4, live Sims can actually interact with the ghosts and the player can also get control of the ghost. 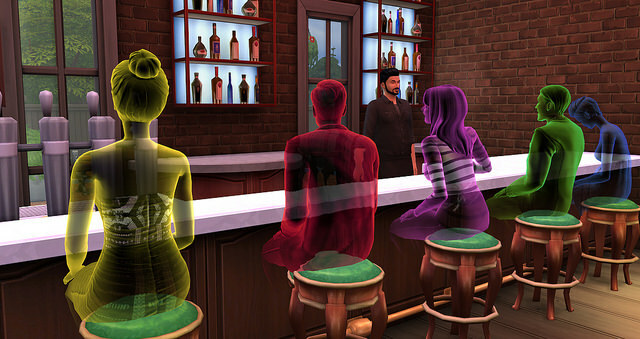 Ghosts are different colors depending on how they die and there are several ways to kill Sims in order to get ghosts. I was playing last night and successfully managed to kill 8 Sims in different ways! The two easiest ways, but take a bit of time, are drowning and starvation. Starvation: put the Sim in a room and remove the door and wait till they starve, it takes a while, but it is pretty simple. Both of these methods do not require any cheat codes if you are willing to wait. However I did find this cheat, I did not use it but I am assuming it will speed up the process a bit. Death by Fire was the one method I had the most trouble with and my primary reason for writing this post because I am not the only one having trouble getting my Sim to start a fire... I kept making various Sims cook who had no cooking skill with a very cheap stove and yet they never started a fire... I also tried using a fireplace with a rug in front with no luck... Finally I remembered I had been playing with a different Sim household the other day and my Sim had started a fire by accident so, I decided to use the same exact oven and sure enough it worked!!! **Here is the exact specifications, for starting a fire with an oven this worked twice for me! I used the Schmapple Oven priced at $10,400 Simoleons. Like the one in the screenshot, had the oven between two counters (not sure if that matters). Also both successful fires were started when I selected "Serve Food" and chose "Scrambled Eggs". Also each time my Sims cooking level was at 1, this cheat will lower your Sims cooking level if need be. This method is the most unsettling to watch... Keep in mind if you chose to lock your Sim in the kitchen other Sims in the house will not be able to put the fire out. I had two Sims in the house when I did this and one I forced to go near the oven once it was on fire and the other I made stand in the yard outside until the first Sim had died then my other Sim put the fire out. Be careful not to unintentionally kill other Sims. I ended up using cheats for the other Death options. I tried to electrocute a Sim without a cheat and it wasn't working, they managed to repair the object without getting hurt... Ha-ha! Electrocution: Wait till an electronic item needs to be repaired (refrigerator worked for me, buy cheap electronics because they are more likely to break quickly) select the Sim you want to electrocute, use this cheat, then have them repair it twice. This cheat will give the Sim the DAZED emotion. Death by Anger (Cardiac Explosion): This one took a bit after using the cheat, the cheat made the Sim angry, then I had to make all the other Sims and her be mean to each other for a while before she finally died. Death by Overexertion (Elders): Although this method states for elders I used this cheat on a young adult Sim and they died within a minute of using cheat. Death by Hysteria (Laughter): This method was quick, I used the cheat, Sims started to laugh and was done for! Death by Embarrassment: Also easy, Sim died within a minute. There are three more methods that I have not used yet, death by old age (working on this one), Sim gets eaten by a cow plant and crashing in a rocket ship. The last two methods require time and building skills. I want to create something like that myself to write The Sims 4 Review.